The Ultimate Horse Tying and Training Tool endorsed by Josh Lyons. Can you imagine never having to tie your horse again? And being able to easily adjust the length of your rope to suit any of your needs? The Smart Tie Safe Clip allows you to do this and so much more! The Ultimate Horse Tying and Training Tool by Smart Tie. Safe, secure and convenient, The Safe Clip has revolutionized the way we tie our horses. No more struggling with knots ~ a simple pull of the rope allows you to effortlessly adjust the length. It’s that easy! The Clip provides an easy transition from one location to the next, safely securing your horse wherever you go. The Safe Clip provides piece of mind by offering added safety. Any horse at any given time can spook and pull back. The Safe Clip provides enough resistance for a horse to feel tied and secure. Should the horse panic, scramble or start to fall, The Safe Clip’s unique design will allow the horse to step back and feel a release of pressure. The horse has the opportunity to calm down while remaining safely tied, helping to prevent damage and injury. As a training tool, horses that have never been tied or those with previous tying issues will benefit from The Safe Clip’s one-of-a-kind design. The Safe Clip is an essential tool and a MUST-HAVE for every horse owner! Use The Clip everywhere - inside or outside the stable, float or truck, the high line while camping or trail riding and for cross tying. The Clip makes it simple to attach your horse anywhere! Even children find it easy to secure their horses safely. You can now feed or water your horse without ever having to tie or untie a knot. 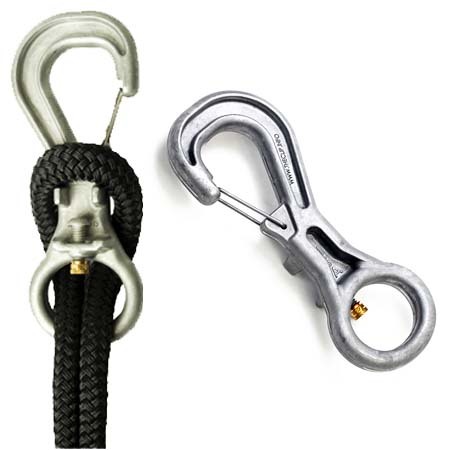 With one easy pull you can adjust the length of your rope as needed. What can we say? The Clip is an essential tool and a MUST-HAVE for every horse owner! THE CLIP WINS INNOVATION AWARD - The Clip was the proud 2009 recipient of the prestigious spoga horse Innovation Award for Best Product in the Safety for Equestrian & Horse category. We are thrilled that 'The Clip' was recognised by this esteemed European organisation.